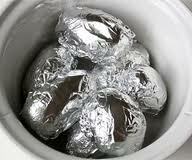 Prepare your potatoes the way you normally do, wrap in foil and put in the crockpot on low for 8 hours. This is great if you are gone all day just put them on in the morning before you leave (if you are comfortable leaving it on when you are not at home). This is good in the summertime if you want baked potatoes but you don't want to use the oven and heat up the house. Do you put water in the crock pot or just leave it dry? I was wondering the same, do you put water in crock pot? No you don't have to put water in the crockpot but make sure to leave it on low, I wouldn't try to turn it on high to make it go faster, I've heard stories that the glass part of the crockpot could crack because of the high heat and no liquid in it.